CAMP FOSTER, OKINAWA, Japan — To help create camaraderie and build relations between two different cultures, 15 American and 15 Okinawan children, ages 9-12, came together for the 3rd Annual Youth Friendship Summer Camp here Aug. 3-5. The three-day camp, organized and sponsored by Marine Corps Community Services Semper Fit Youth Sports, is an event that provides a variety of different activities for children to participate in while finding a common bond with one another, according to Jason Kozerski, program manager, Semper Fit Youth Sports, MCCS. The 30 children were broken up into six groups of five, with each group having two team leaders. One team leader was a member of Semper Fit Youth Sports and the other a summer intern. The first day began with an opening ceremony and introductions of the six teams. The children then participated in an obstacle course, went to lunch and concluded the day with a variety of races and a game of dodgeball. The children visited Awase Water Park on the second day, and they went to a movie in Chatan Town. 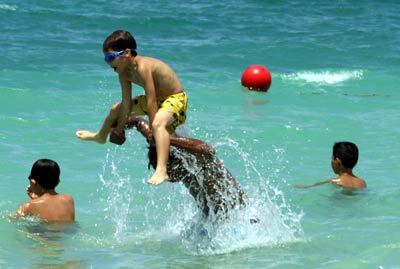 Day three saw the children take a trip to Okuma Beach to frolic in the sand and surf. 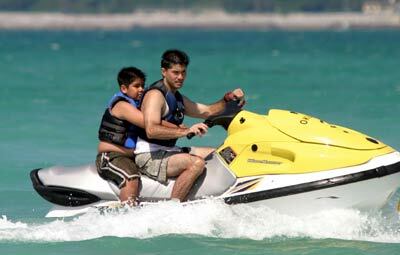 Activities included rides on personal water craft, banana boats and inner tubes. A moment at Okuma showed Kozerski what he had been looking for. He said that one of the Japanese kids waiting in line for a personal water craft ride was standing behind an American kid who was next in line. When the event was over, many of the children had learned something new about their foreign friends. Jeremy Franklin, 10, attended to have some fun and meet new people, and he found a few of the Okinawans had a talent he lacked. “They can move their ears up and down. I can’t do that,” Franklin said. For 10-year-old Nodoka Higa, the camp was a chance to play with Americans and get to know them better. However, Higa did discover a strange American habit. “Some of the Americans put soy sauce on their rice. That was new to me,” Higa said. 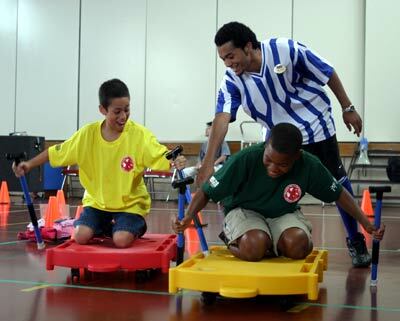 Not only did the camp provide a chance for fun and understanding, it also gave the staff an opportunity to play an important role in the lives of the children, according to Frank Johnson, summer intern, Semper Fit Youth Sports, MCCS. In the end, Johnson hopes the camp made a lasting impression on everyone involved.